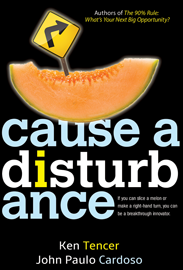 If you can slice a melon or make a right-hand turn, you can be a breakthrough innovator. The title of this book, Cause a Disturbance, says it all, and it most assuredly will cause a disturbance in the way you think about business: your business. Everyone knows—and everyone talks about—how important innovation is in the competitive battle to find, delight, and keep customers, yet far too few achieve it. As Tencer and Cardoso explain, “There’s a big difference between an occasional spark of innovation and an eternal flame.” But the reality is different; most firms struggle to consistently innovate. All that can change. Kick-start your business with attitude. Cause a disturbance! Cause a disturbance in the way you think about innovation as you open your mind to the possibilities—and simplicity—of being innovative every day! The book is available for purchase online at these fine retailers. Opportunities grow businesses. Knowing which ones to capitalize on is what drives business success. In this milestone book, Tencer and Cardoso have integrated three fundamental principles of good business – leverage, process and entrepreneurial thinking into a pragmatic and powerful approach to business development. Years of hands-on research has shown them that the greatest opportunities lie in focusing on those that you are already 90% capable of. Full of captivating company examples and practical advice, this vital new resource shows you how to turn your opportunities into action. 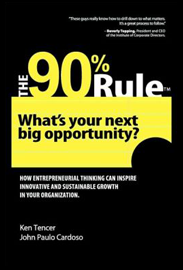 The 90% Rule is a practical, step-by-step action plan that lets companies tap in to their unique strengths and potential. It gives CEOs and their teams the requisite process to crystallize a growth strategy and then the tactics to implement it. Are you ready to turn your opportunities into action? Your competitors are.